Asthma is a very common and serious condition. It is one of the most common chronic respiratory conditions affecting North Americans, and although, there is no known cure for the disease, there are many effective forms of treatment that one can use to manage their condition and relieve asthma symptoms. 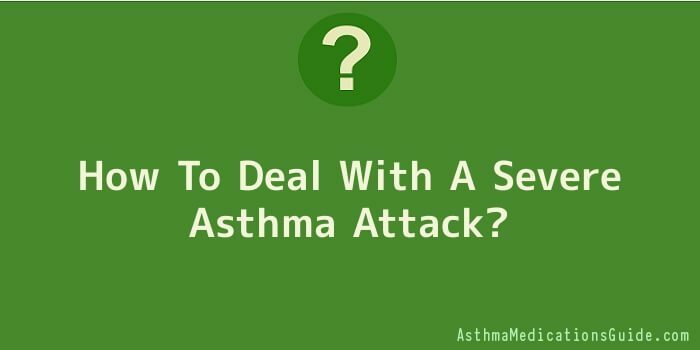 Whether it is you or someone that you know who is suffering from asthma, you are going to need to know how to deal with an asthma attack, especially a severe asthma attack. A severe asthma attack can do more than just frighten the person, it can actually do damage to the body and possibly even result in death. One of the most important things is for you to realize the difference between a normal asthma attack and a severe asthma attack. In a severe asthma attack, the smooth muscles of the bronchi will narrow and the tissues that line the airways will swell from inflammation and then secrete mucus into the airways. The top layer of the lining of the airways often becomes damaged and sheds cells, more so if the asthma attack is especially severe. There are many triggers that can provoke an asthma attack, and this includes cigarette smoke, cold air and viral infections. It is important, no matter how serious your asthma condition, that you are aware of the different asthma treatments and remedies that are out there. This will not only help you avoid the onset of asthma attacks, but as well will make you healthier in general. You will have to work together with your doctor in order to decide the best treatment goals. You will also need to make sure that you avoid things that bring on your asthma symptoms or make your symptoms worse, and use the appropriate asthma medicines. With proper treatment you should be able to get and keep your asthma under control, have fewer asthma attacks, and need to use quick-relief medicines less often. A severe asthma attack can be an incredibly frightening and debilitating thing, but if you ever experience one you are going to need to make sure that you stay as calm as possible and keep your breathing as normal as you can. Also make sure that if your doctor puts you on any medicines you take the right dosage and stay on it. Never go off your medication or discontinue any treatments for asthma unless your doctor tells you to.